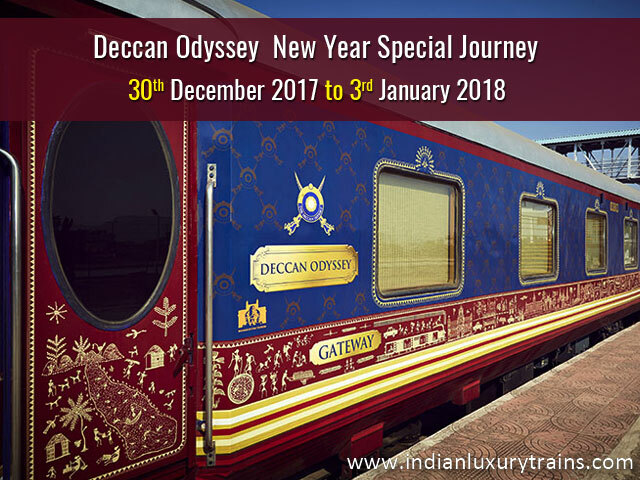 Deccan Odyssey, the Indian Luxury train, seeks to celebrate the arrival of the New Year with a new itinerary called the 5-day "SUSEGADO GOA" journey. This brilliantly crafted journey seeks to ensure that the New Year, lasting from 30th December 2017 to 2nd January 2018, is celebrated with enormous gusto and enthusiasm by reveling in the delights and pleasures that Goa has to offer. The guests will not only have a memorable time on the train but also experience the various fascinations that Goa has to offer. This year, celebrate the New Year immersed in luxury and vigorous merrymaking. “Susegado”, which is a Portuguese phrase, signifies the celebration of life in all its glories. Indeed, it’s only appropriate that this itinerary is sought to be introduced on the occasion of the New Year in Goa, since life is looked upon as a celebration here. The newly introduced train journey will take you to the beautiful and mesmeric beaches of Goa, where the gently swaying palm trees, the gentle echoes of the sea, the soothing sea breeze brushing against your skin and the relaxed vibe will transport you into a world of sheer bliss. Here, you will come across the glorious and ancient heritage of Goa, much of it heavily influenced by the Portuguese legacy, in the elegant Old Goa churches scattered all across the state. Enjoy the taste of Goan cuisine along with the soothing Feni, the playful local brew composed of cashews. Shop your heart out as incredible bargains wait in store for you. A distinguished aspect of the famous Deccan Odyssey New Year Journey constitutes a memorable journey through the picturesque Konkan region, traditional welcome on-board, New Year Gala Dinner, lavish meals on-board the train and at special venues, free flowing IMFL combined with flexible tour with multiple optional programs. Have a gala time in Goa while being immersed in comfort and luxury with one of India’s finest luxury trains. Deccan Odyssey, one of India’s finest luxury train, is a joint initiative between The Ministry of Railways, Government of India & State Government of Maharashtra. One of the most famous luxury trains in India, it has been awarded with the World Luxury Award seven times. This incredible railway journey seeks to showcase the finest aspects of heritage, culture and natural beauty of India. The interiors of this luxury train amalgamate the comforts stemming from state-of-the-art modern day amenities with the elegance and opulence reflective of the past. The artistic skills and traditionalism of the Deccan region is reflected brilliantly by the décor of the train. All the cabins are equipped with contemporary amenities like Wi-Fi Internet, LCD television, individual climate control etc. The facilities further include a personal attendant, spa saloon, fitness center, dining cars, conference room and bar and lounges.